Poor uniformity of pharmaceutical products poses potential threats to public health. From the manufacturer’s perspective, poor uniformity can have liability implications. It also generates unacceptable amounts of discarded product, resulting in significant loss of revenue. The C-Therm ESP™ uses effusivity – a unique thermal property of all materials, including pharmaceutical ingredients – to evaluate the consistency of blended powders before they are processed into tablet or capsule form. 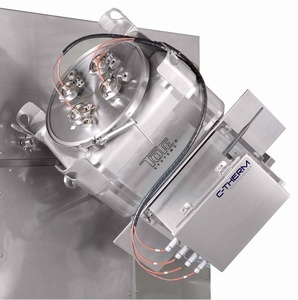 C-Therm Technologies (formerly Mathis Instruments), in collaboration with major pharmaceutical companies, manufacturers of powder blending equipment, and the FDA, has developed an innovative system to determine powder consistency in real time during the blending process without compromising the ingredients or the mixture. Using the principles of thermal effusivity, C-Therm has developed the ESP Blend monitoring system, a revolutionary, pharmaceutical blend uniformity monitoring system. This retrofittable system is designed for phased implementation, and provides valuable production information in real time. The ESP addresses Process Analytical Technology (PAT) requirements and offers significant cost savings to manufacturers. For specific product information about the ESP blend uniformity monitoring system, click here.